FBI isn’t just outing Carter Page. It’s signaling to his Trump-Russia co-conspirators they’ve been had. 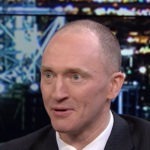 If you’ve ever seen Donald Trump campaign adviser Carter Page interviewed on television, you’ve probably concluded that he’s an idiot. Turns out you’re in good company. Russian spies have literally described Page an “idiot” – and even the leaders of the Trump campaign seemed to think he was an idiot. Now the FBI is outing Carter Page this evening, in a likely signal to his Trump-Russia co-conspirators that it’s time for them to come in. My initial reading of tonight’s Washington Post report, which confirms that the FBI has had a FISA surveillance warrant on Carter Page since last summer (link), was that the FBI has leaked this information for strategic reasons. After all, the leak is credited to “law enforcement and other U.S. officials” which means it didn’t so much leak, as the FBI decided to officially announce it and just couldn’t put its own name on it. Rachel Maddow then made a keen observation during her MSNBC show this evening, pointing out that FISA warrants never leak. This isn’t the kind of thing that a low-level intel community employee would dare leak to the media unilaterally. This would have come from the top, and with great thought behind it. So why is the FBI doing this right now? For one thing, it’s publicly signaling to Carter Page that it has ten months of dirt on him; it knows everything he’s said and done during that time. The FBI is also signaling to others in the Trump campaign that it knows about everything they were conspiring with Page on.